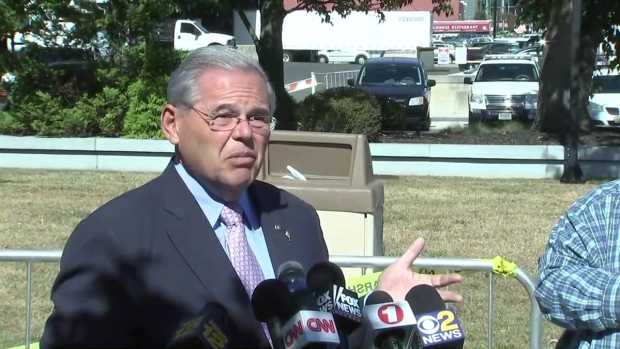 Prosecutors at the bribery trial of U.S. Sen. Bob Menendez have presented evidence that a wealthy donor on trial with him contributed $600,000 to organizations that supported the New Jersey Democrat. They are trying to tie the donations by Florida eye doctor Salomon Melgen in 2012 to actions Menendez took around the same time that prosecutors say were to lobby for Melgen's business interests. A fundraiser testified Wednesday that Melgen donated the money to a political action committee earmarked for New Jersey. Earlier testimony described Menendez meeting with health and homeland security officials on issues that affected Melgen's medical practice and his port security company. Menendez and Melgen, who are longtime friends, deny the charges. They say there was no bribery arrangement. The trial is in its fifth week.